Once you’ve been faced with cancer-related veterinary bills, you can see how the cost of great veterinary care rivals that of human medicine. We all want the best for our Tripawds, but sadly, most of us have faced a situation where we must choose between what we can afford, and how we can give the best medical care to our Tripawd without going broke. But what if we didn’t have to choose? What if our dog could have all of the best medical care when she needs it most? It’s called Pet Insurance, and it can be there for you when you get surprised with an unexpected, large vet bill. Although fewer than three percent of animal pawrents in the U.S. have it, pet insurance can cover the costs of everything ranging from general check ups to advanced cancer care, if you choose your plan carefully. 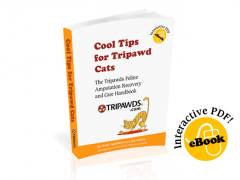 Tripawds first covered this topic back in 2008, and since then, more companies have started up and policies have become more comprehensive than ever. Before you commit to a plan, be sure to download the e-book, “The Truth About Pet Innsurance,” a 45- page report that takes an unbiased approach toward comparing insurance companies to one another. Finding the best pet insurance plan that offers the correct benefits for your dog’s particular needs. Which insurers are stable enough to be there to pay the vet claim when your dog is injured or sick. How to know that you’re making the right pet insurance choice today for your dog’s future. This comprehensive e-book report comes with a 60-day money-back guarantee. If you’re not satisfied for whatever reason, within the first 60 days, simply e-mail the author with your refund request and he will refund your payment, no questions asked. Learn more by visiting “The Truth About Pet Insurance” today! 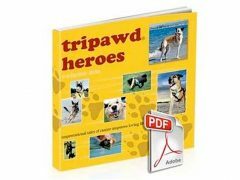 Tripawds New eBook: What Do You Think?